Cloth “Portrait of the chorus girl” was a new word in the Russian pictorial art. Previously, none of the domestic artists dared to write in a similar style. Korovin was in some way a pioneer. And the main reason for this was the pronounced features of impressionism. The picture is painted in a colorful way, but at the same time, the color scheme is distinguished by a certain freshness. 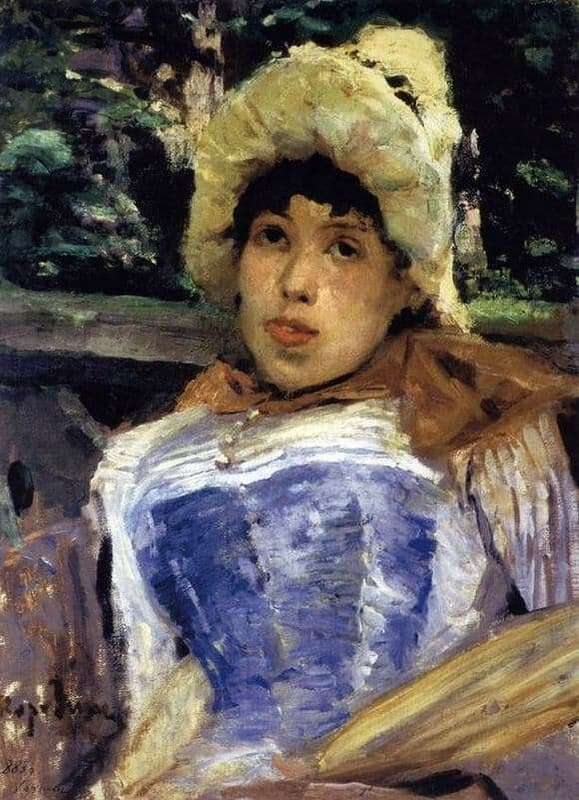 The portrait was painted on a balcony in a public garden, and according to Korovin, the woman was ugly, even a bit ugly. In fact, the girl depicted in the portrait looks even somewhat awkward. The eyes are directed upwards and look a bit oblique. Excessively plump lips parted, and the pose in which the woman sits, it seems even unnatural. Palen even asked Korovin to remove this masterpiece from the exhibition, as no one liked it. Later, Korovin again recalled the portrait and said that Mamontov, on the contrary, liked the picture so much that it was thanks to her that the artists met. And the same Palen gave it to Mamontov so that together they could sort out this incomprehensible painting with large coarse strokes. The face of a woman in a blue hat on a background of green foliage is written brightly and vividly. Despite the cool shades of the sketches, it is felt from the picture how warm the sun and the summer light are. According to such Russian artists as Repin and Mammoth, the portrait of the chorus girl was written by the Spanish master. Not knowing who the author of the canvas was, they claimed Korovin that Russian could not write so boldly. And this creativity is painting for painting.